In spite of many differences — notably in size and level of development — Canada and the Caribbean Community have had a long and comfortable friendship and an empathetic partnership. An example of the closeness: The Canadian-made soft drink, Canada Dry ginger ale, used to boast on its label that it was made “with Jamaican ginger.” It has been a relationship in which Canada has given support for the small island states of the English-speaking Caribbean dating back to the colonial era. The fraternity no doubt has origins in common institutions, cultural affinities and shared history. Canada has supported the Caribbean with development assistance in various spheres. For example, in transportation, Canada gave two ships to assist in the transportation of goods and people during the short-lived West Indies Federation of the early 1960s; and Air Canada helped in the startup and early operations of Air Jamaica. In development banking, Canada was a founding member of the Caribbean Development Bank in 1970 and also cancelled the debt of several Caribbean countries. Haiti is one of the largest beneficiaries of Canadian development assistance in the Americas. The Canadian government has provided more than $1.47 billion in aid to Haiti since the 2010 earthquake, including approximately $264 million in humanitarian assistance. Using its international position, Canada has supported issues relating to the Caribbean, especially those from the smaller Caribbean countries. For example, Canada has co-operated with the Caribbean on small-state security in the Organization of American States (OAS), on climate change at the United Nations and it represents the Caribbean on the board of directors of the International Monetary Fund and the World Bank. The people nexus has reinforced the fraternity. Approximately 338,000 people of Caribbean origin live in Canada, concentrated in and around Toronto, with Jamaicans accounting for approximately 40 per cent. People of Caribbean origin and descent have distinguished themselves in academia, politics, the judiciary, the church and in sports. Jamaican-born Donovan Bailey became the fastest man in the world, running for Canada in the I996 Olympics. From 2005 to 2010, Haitian-born Canadian stateswoman Michaëlle Jean was the 27th governor general of Canada. More than 770,000 Canadians vacationed in the sun and sea of the anglophone Caribbean in 2016, mainly during the winter. Temporary workers from the Caribbean are engaged seasonally in agriculture and hospitality. They, along with Caribbean-Canadian citizens, send significant amounts of remittances back to the Caribbean region. The stock of foreign direct investment is currently small, but in the past, it has played a part in economic development, notably in the commercial banking system. Indeed, before establishing central banks, some governments of the region banked with the Bank of Nova Scotia. Alcan, now known as Rio Tinto, has had a long history, building and operating two aluminum refineries there in the 1950s. Investment has been facilitated by bilateral treaties with Barbados and Trinidad and Tobago. Potential for trade and foreign direct investment is strong in tourism and energy. It is estimated that Guyana’s coastal area holds recoverable oil reserves of about 13.6 billion barrels and gas reserves of 32 trillion cubic feet. Relations between Canada and CARICOM have been friendly and comfortable, but both sides exhibit a complacency towards deepening ties. This is a missed opportunity, and more so on the Caribbean side. As it is a preferential trade agreement, CARIBCAN requires periodic waivers at the World Trade Organization, which are increasingly difficult to nail down. There is a need to modernize and secure the formal trade arrangements. A plan for a Canada-CARICOM free-trade agreement was announced in July 2007, but after seven rounds of negotiations, Canada and CARICOM were not able to reach an agreement on scope, methodology and extent of liberalization. The negotiations have been adjourned with no agreed-upon date for resumption. The Caribbean is one of the regions of the world that is most vulnerable to the impact of the growing intensity of climate change. Its small island states suffer the ravages of frequent natural disasters. There have been 238 recorded disasters in the Caribbean caused by hurricanes between 1950 and 2014. The devastation of hurricanes Irma and Maria of 2017, which killed more than 1,400 people in Dominica, Antigua and Barbuda and Puerto Rica, is still fresh in our minds. The recovery will take years, is beyond the means of the local population and requires the assistance of the international community. Reconstruction is necessary, but it will have to be complemented by measures to build environmental and economic resilience. To the credit of the leaders of the devastated islands, they decided to make their countries “Climate Smart.” The innovative vision for the world’s first climate-smart zone garnered the support of Richard Branson, founder of the Virgin Group. The vision became the concrete proposal called the Caribbean Climate-Smart Accelerator, which was born at French President Emmanuel Macron’s One Planet Summit. The objective of the accelerator is to help in the economic transformation of the region through a combination of public and private investment projects that support climate resilience and economic growth through sustainable development. Particular attention will be devoted to disaster preparedness, investment in low-carbon development and a more robust infrastructure and built-environment. In addition to its ongoing porous coasts and airspace, transnational crime, narcotics trafficking and new security threats such as cyber-crime and manipulation of social media have proliferated in the Caribbean. Small states tend to be “soft” targets because they do not have the full panoply of counter-terrorism capability at the national level. Recalling Bali and other strikes against tourist resorts points to the need for more multilateral co-operation, especially in tourist-intensive countries and cruise ship destinations. Canada has been a consistent source of training, information-sharing and security co-operation. The small island developing states have been trying to adjust to twin challenges of sluggish global economic conditions and the recurrent incidence of natural disasters of ever-increasing severity. The endeavour has been to build resilience. According to the Inter-American Development Bank, the small developing economies of the Caribbean were the hardest hit by the global economic recession and continue to contend with such challenges as high levels of debt. The current international political and economic environment is not one that will be helpful to small states in achieving sustainable development goals by 2030. Even in the small states, such as those in the Caribbean that have attained middle-income status (those with a per capita gross national income between $1,005 and $12,235, which means all but Haiti), there are challenges in some areas in particular, such as sustainable development goal No. 14, which aims to conserve and sustainably use the oceans, seas and marine resources. Canada should continue to offer technical assistance to small states when it comes to internal managerial, administrative and policy issues. Some of the problems facing small states are self-inflicted, most notably the unsustainable external debt burden of governments in the Caribbean and the Pacific. Debt-to-GDP ratio in several countries is well above levels that would allow these economies to grow out of this macroeconomic chokehold. This makes fiscal consolidation a necessity at a time when prudently directed fiscal policy stimulus could stabilize and promote economic growth. The total debt of the highly indebted small middle-income developing countries is small and is manageable enough for the international community to act through a specially designed multilateral debt relief facility to provide substantial assistance. Canada provides technical, financial and diplomatic support to developing island states in sustaining the work on climate change and building environmental (built and natural) and macroeconomic resilience to natural disasters. These states are on the front line and their plight is urgent, as the effects of climate change seem to be happening now and not in a distant dystopian future. Small island states have small populations, limited amounts of and a narrow range of natural resources, minute land areas and national markets that do not yield economies of scale in most lines of production. However, they have highly educated human resources and large maritime resources, which, to date, have been largely unexploited. These include fishing and rich potential from seabed mining, oil and natural gas. The blue economy represents an enormous amount of resources that are either untapped, such as offshore oil in Guyana, or under-used, such as fish stocks in the Pacific. The exploitation of these resources has the potential to boost economic growth in several small economies. In this regard, the idea for a Blue Commonwealth Charter — a co-ordinated push on the part of Commonwealth countries to protect the ocean from the effects of climate change, pollution and overfishing — is an innovative and timely one. In the current circumstances of global turbulence, relations between Canada and CARICOM remain healthy, but there is considerable potential to enhance and strengthen the partnership in a variety of areas. On the economic front, Canada has maintained steady growth while the Caribbean needs to complete a strategic global repositioning. Innovative technologies could be the catalyst for more stimulating economic co-operation. Improved connectivity, nano-technology, mini-components of globally dispersed value chains, the individualization of work, new corporate institutional forms and new research networks make the traditional lack of economies of scale in production of goods less of a constraint for the Caribbean. The use of the internet for international sourcing and marketing, especially for high-end products and business services, which are being increasingly outsourced, are areas in which small developing countries could penetrate the Canadian market. Beyond the declining importance of economies of scale, small states need to seize the possibilities of confluence of revolutionary new technological innovations, which are rich in implications for all aspects of human activity. Canadian foreign direct investment could facilitate entrepreneurial agility and capitalization on opportunities that can offset the disadvantages of Caribbean countries’ small sizes, at least in the short run. 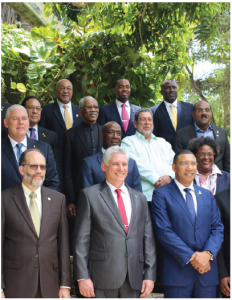 Canadian co-operation with the Caribbean for strategic long-term “foresighting,” involving public-private collaboration, would help identify new international corporate links that could continuously enhance the international competitiveness of nano-firms in small developing economies of the Caribbean. Specific trade growth areas include energy, tourism, export of health care, higher education and business outsourcing. Richard Bernal is a diplomat and economist in Jamaica and pro-vice-chancellor for global affairs of the University of the West Indies. He was Jamaica’s ambassador to the U.S. and permanent representative to the Organization of American States.